This kit of parts is intended to build a current regulator optimized for driving one or more LEDs. Included is an Integrated Circuit Current Regulator (Regulator IC) that controls a suitable high gain transistor to supply the current for the LED load. A low value resistor senses the actual current and this �feedback signal� is sent to the Regulator IC where it is compared to an internal reference to determine the drive for the transistor. The circuit also uses two additional resistors and a capacitor for stability and protection. It�s not necessary to use these values, of course. You can calculate the value needed for any current by dividing 65 by the desired current in mili Amps. The completed assembly is slightly smaller than half an inch wide, a bit less than an inch long and under half an inch thick. It connects with two wires from the battery and with two more to the LED to be driven. A key feature is �Low Drop Out�, that is this is a true LDO series regulator. In general it�s able to maintain proper regulation with a battery as little as one tenth of a Volt higher than the necessary load (generally Vf for the LED or LEDs used). This means a close match of battery to load can give very high efficiencies indeed. While it�s assumed that most will want to preset a current (typically �full blast�), it�s easy to make it adjustable. One such scheme is to put a low value resistor in (say 47 ohms) to establish a base current. Then use a switch to add one or more resistors in parallel (connect the switch and resistor network between the LED minus and Battery minus terminals). The total current will be the total normally supplied using those resistors, that is adding the ten ohm resistor (6.5 mA) to the 47 ohm base (1.5 mA) gives us a total of 8.0 mA. To make this continuously variable (i.e. �volume control�) use a low value variable resistor (often called a �pot� for potentiometer), say 50 or 100 ohms as an external resistor. You should put a small value resistor in series with the variable one (say the 2.2 ohms) to limit the �full blast� current. There is a practical limit to raising the current. Currents above 120 mA are not practical with this transistor. Currents above that level raise the minimum Drop Out Voltage, cutting into efficiency. Modified versions can raise this limit within constraints of total power. Indeed versions using a different transistor and a short length of fine wire as a sense resistor have been used to drive one Watt Luxeon LEDs. While the typical use is driving a single LED from a three or four cell battery (four to six Volts), other configurations are possible. For instance, driving three LEDs in series from a 12 Volt source is easily done. A 1000 ohm resistor is included for such uses, slight performance improvements can be had by using it rather than 390 ohms for the resistor between the transistor and regulator on the assembly. Not doing so (or using 1000 ohms in a lower voltage system) will not cause serious problems, but this simple substitution will optimize things a bit more, particularly at the end of battery life as it goes into �direct drive�. Within reason, shorts and reversed battery should not bother the circuit. Nor should connecting the LED �backwards� cause failure of either it or the regulator. Simply correcting the errors should get things going again. 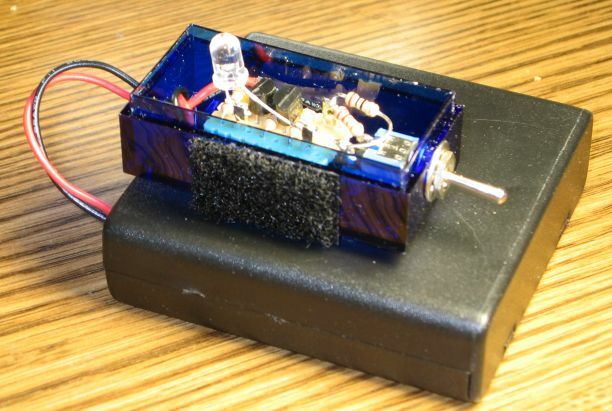 To make this assembly you�ll need a small pair of wire cutter to trim leads. Small pliers or a small screwdriver or similar tool to help bending leads is a help. However a good job can be done with fingernails or other improvised tools as well. Good cutters, preferably flush cutters are important. In a pinch, fingernail clippers work fairly well at nipping off the small soft leads involved. Solder and a soldering iron will of course be needed. Before starting you might want to smooth any rough edges on the board with a file or sandpaper, it�s much harder to do so after it�s assembled. 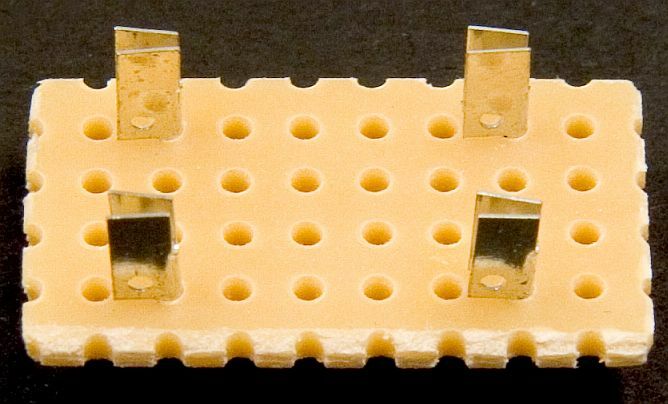 You can also trim the first row of holes off the board, making it .1 inches shorter, at the expense of some protection for the Battery and LED minus connections. This assembly uses �flea clips� for inputs and outputs, although you need not do so. Wires could simply be inserted into those holes and soldered in place. The clips just provide an easy way to modify and use the circuit after it�s built. They are made of thin Tin plated Copper. In practice, they are inserted from the top through the holes. Circuit connections to them are done on the bottom, leaving the top slot free to accept wires when the assembly is put in service. Begin the assembly by holding the board horizontally so you have four rows of 8 holes each. From the upper left corner, let�s call these rows A, B, C, and D (top to bottom) and the holes in each 1, 2, 3 and so on from left to right. Insert �flea clips� into holes A2, D2, A7 and D7. In each case the �flag� on the clip should point to the left (the clip in A2 should overhang A1 and so on). An easy way to do this is to use the body of one of the resistors as a tool. Drape the clip over the resistor lead with the top of the flag up against the resistor body. Pinch it and the resistor together and push the lead with the clip around it down into the hole in the board (using the resistor lead as a guide). Then pull the resistor lead out. Next, bend the leads on the three resistors you intend to use at right angles as close to the body as possible. Insert the first 390 Ohm (Orange, White, Black, Gold) into holes A8 and D8 (pulling the resistor tight against the board). Likewise, insert the other 390 Ohm resistor into holes A5 and D5. The selected current setting resistor (say 2.2 Ohms, Red, Red, Gold, Gold, for 30 mA) goes into holes A3 and D3. Spreading the component leads a bit helps hold them in place until they�re soldered in. Next insert the capacitor into holes B7 and C7 (between the two flea clips). The LM334 goes into holes B4, C4 and D4 with its flat side facing left. This part should be inserted (spreading the leads) in to the board until its just above the resistor under it, say 1/8 inch above the board level. The 2N3906 goes into holes B6, B7, and B8 facing right (this means the two �transistor package parts� are back to back). They have their round sides touching, flat sides (with the printed labels) facing out, again insert the part to about 1/8 inch. � D2, D3, and D4 connect together. Bend the transistor lead at D4 down against the board, past D3 �on the C3 side�, and wrap it around the flea clip at D2. Then bend the resistor lead at D3 down tight over it (�straight down� toward C3). Trim the two leads and solder in place at D2 and D3. � D6 and D7 connect together. Bend the transistor lead at D6 flat to the board then wrap it around the flea clip at D7, cut to length and solder down at D7. � D8 and C7 connect together. Bend the transistor lead at C7 flat and then up and around the base of the resistor lead at D8. Be sure to put a kink in the lead to keep it away from the flea clip at D7. Fold the resistor lead down over the transistor lead as close to D8 as possible, cut both to length and solder at D8. � A2, A3 and C4 connect together. Bend the transistor lead at C4 flat then down and around the base of the resistor at A3 (again put a kink in it to avoid the B4 area). Bend the resistor lead at A3 down flat then loop it around the flea clip at A2. Trim both leads and solder down. � B4 and A5 connect together. Bend the two leads toward each other, trim them off at the other hole, bend one or the other down tight over its mate and solder down. � D5, C6, and B7 connect together. This one�s tricky. Bend the capacitor lead at B7 down, run it past the transistor lead at C6 and around the base of the resistor lead at D5. Now bend the transistor lead at C6 down over the capacitor lead tightly. Trim both leads, inspect carefully for clearance around B6 and D6, and solder down at C6 and D5. � B6, A7, and A8 connect together. Bend the resistor lead at A8 flat, then around the flea clip at A7 and up next to B6 on �the A6 side�. Fold the transistor lead at B6 snugly over the resistor lead, trim both and solder down at B6 and A7. In each case, the leads involved should be bent to make contact, cut to length and soldered together. Be sure to check for shorts where the leads are close together like at B4, C6, A7, D7 and similar �tight spots. Try to keep things tight to the board. 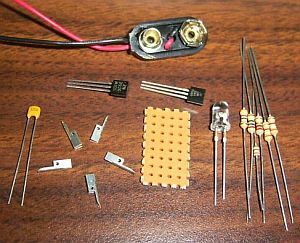 Included in the kit should be a �9 volt battery snap connector� with wire leads. Soldering it to the top end of the Battery flea clips (by inserting the end of the wire in the slot between the two halves of the �flag�) allows us a quick way to power the circuit up. The Red lead goes to D7, the Black to D2. You can attach a 9 Volt battery, spread the leads of an LED and slip them into the LED clips (soldering not necessary for quick checks). Efficiency with 9 Volts in will be poor, of course, but for quick checks that shouldn�t be an issue. Once you�re satisfied that everything is working OK, you might consider a coat or two of clear fingernail polish to protect the back side of the board from shorts, moisture and the like in later life. Double stick foam tape is often a good way to mount small assemblies like this. A coat or two on the top side, right over the parts and wires, will complete the protection (should you decide you need to).